Cardinal Allen Catholic High School was officially opened by the Roman Catholic Bishop of Lancaster, the Right Reverend Brian Foley, on the 2nd March 1963. 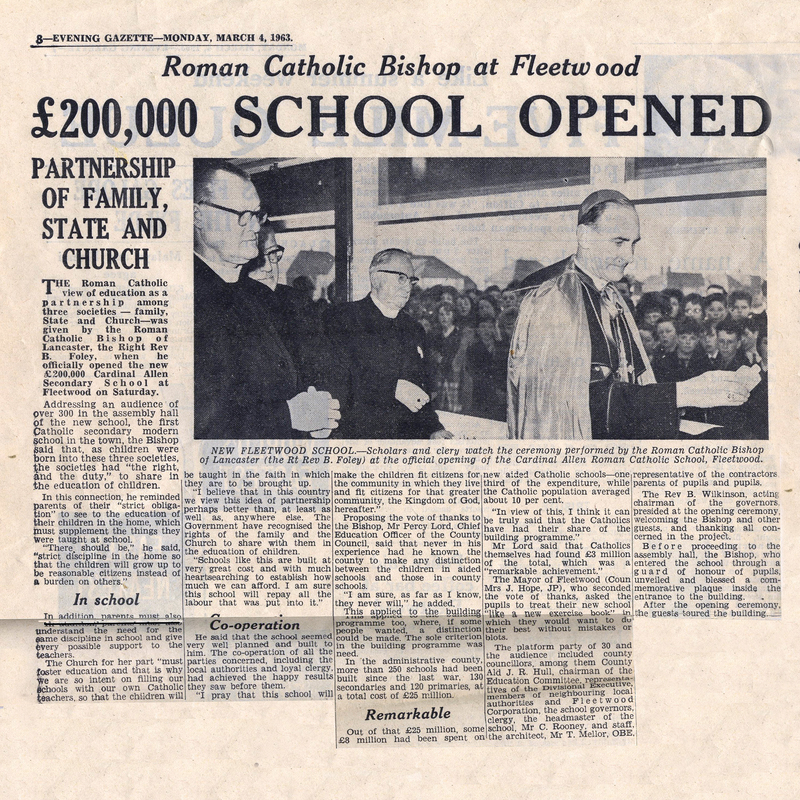 Cardinal Allen Catholic High School was officially opened by the Roman Catholic Bishop of Lancaster, the Right Reverend Brian Foley, on the 2nd March 1963 to serve families from Fleetwood, Thornton Cleveleys, Poulton-le-Flyde and Over Wyre. Mr. Cyril Rooney was the founding Headteacher and stayed at the school until his retirement in 1981. His successor, Mr. John O'Brien retired in 2005 and the third Headteacher, Mr Philip Mooney led the school until leaving for a second headship in 2015. Mr Andrew Cafferkey was appointed as Headteacher from April 2016 having previously been the Deputy Headteacher. In 2013 we celebrated our Golden Jubilee with pupils and staff, past and present. Our school first opened to cater for the needs of 400 pupils and fifty-three years we now serve the needs of approximately 820 pupils, with over 50 teachers and 55 support staff. William Allen was born in 1532 in Rossal Grange, Lancashire, England. He was the third son of John Allen and Jane Lister. He was educated at home until he was fifteen, when he entered Oriel College, Oxford. By 1550 he had a B.A. and was a fellow of his college, and in 1554 he completed his M.A. In 1556 Allen was chosen as principal of St Mary's Hall, Oxford and Proctor of the university. In 1558 he became a Canon of the Cathedral Chapter of York, even though he was still a layman, but had decided to enter the ecclesiastical state. Allen's zeal and loyalty to the Roman Catholic Church meant that he had to resign all his posts at Oxford on the accession of Queen Elizabeth I in 1558, and he went to Louvain, Flanders in 1561. The following year he returned home in very delicate health and remained there for three years, when he then left England forever. Later in 1565 Allen was ordained to the priesthood at Mechlin. Here he lectured in Theology in the Benedictine college. Whilst there he conceived the idea of a college for English students on the continent, and in 1568 opened the first and most famous of such institutions, at Douai, Flanders. In 1570, he was created a Doctor of Divinity and appointed Regius Professor of Divinity at the college, which he continued to administer and serve until 1588, although in 1585 he had moved to Rome. In 1576, Allen created his second seminary, converting the English Hospice in Rome into the Venerable English College. Its first students arrived there from Douai in 1577 and Pope Gregory XIII (1572-1585) issued the Bull of Foundation in 1579. Allen's other major achievement was editing the vernacular version of the Sacred Scriptures known as the Douai Bible; the New Testament was published in 1582 in Reims, where the college had temporarily moved and was under his presidency; and the Old Testament was published in Douai in 1609. In the Consistory of August 7, 1587 Allen was created a Cardinal and by the end of that month he received the red hat and the title of Ss Silvestro e Martino ai Monti. He also received the title of Cardinal of England and was the first English cardinal after the protestant Reformation. On November 10, 1589, King Felipe II of Spain nominated him Archbishop of Mechlin but he was never recognized apparently because of the state of destitution of the See and the unwillingness of the king to provide the archbishop with a fitting revenue. Cardinal Allen also participated in the conclave of 1590, and the newly elected Pope, Gregory XIV (1590-1591) named him prefect of the Vatican Library and entrusted him, together with Cardinal Ascanio Colonna, with the revision of the Latin Vulgate. As Cardinal, Allen also later participated in the conclaves of 1591 and 1592.